The first idea of how to do the assignment was to take different portraits in the styles of different painters and photographers. With this image I have stepped out of that idea a bit. After doing the focal lens exercise, which I still have to write a blog about, I realised that I wanted to show the effect of a long focal length in portraits in a busy environment. 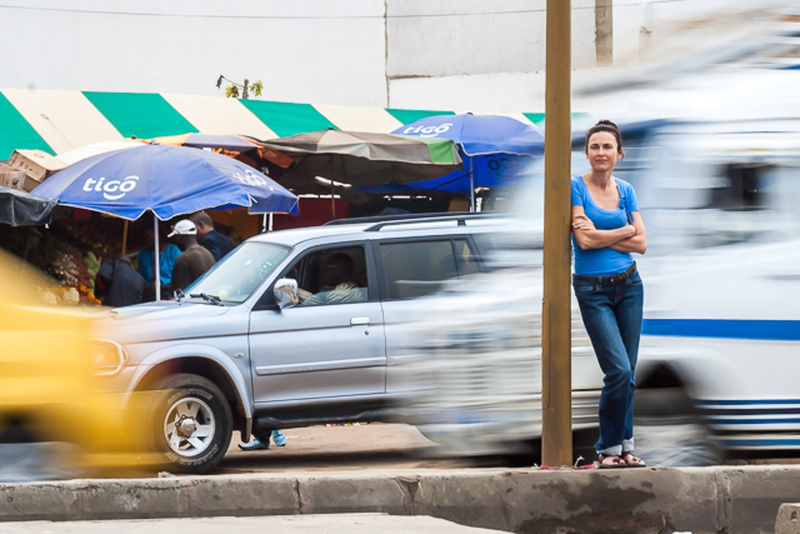 There are lots of busy environments in Dakar, so that wasn't too difficult to find. In this traffic scene I want to show the business and compactness of all the vehicles contrasting to the subject who is standing still. It's hard to choose from these four. I like them all for different reasons. The first one shows a nice contrast between movement and still. Because the car directly behind the subject is blurry, the subject is more isolated from the scene, even though because of the long focal length, everything seems very close by. 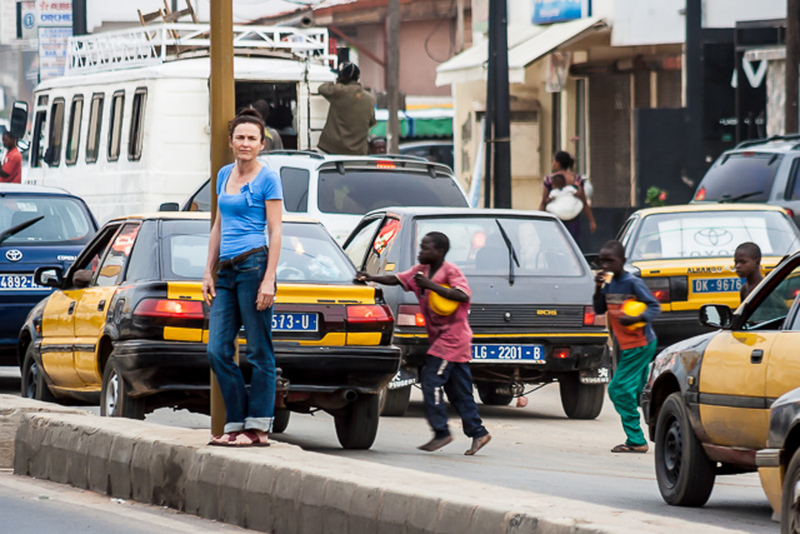 The second image gives a nice sense of street life in Dakar, with the street kids running across the street, the lady with the baby on the back and guy standing on the back of the bus. On the other hand, the subjects in the image don't look very compact, because I used a shorter focal length. This compactness is very visible in the third image. The building in the back is really far away and with your normal eye you don't even notice it from that distance. I like the combination of colours and the way the subject seems to be squeezed in between the trucks and totally out of place in the scene. The fourth image is a bit weird and seems to be made out of 3 different entities. The blurry bus is separating the subject completely from it's background, but because the subject is on the side of the frame and the focal length was long, this background has been put pretty much to the foreground, as if it's almost next to the subject. It's hard to choose. Considering the fact that I want to show a portrait of the subject and not an image of a street scene in Dakar, my preference goes to the first image. In here the subject stands out most, there's a nice contrast between movement and still, horizontal and vertical lines and colours. On the other hand, it does show some of the city life of Dakar and the compactness of the long focal length.